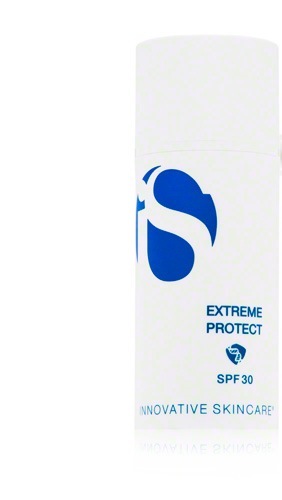 iS by Innovative Skincare Extreme Protect SPF 30 hydrates, repairs and protects the skin during sun exposure. Gotu kola extract promotes elasticity to diminish the appearance of fine lines and wrinkles. Aloe and vitamin E soothe, nourish and smooth the skin. Olive leaf extract reduces redness and protects against sun damage. A moisturizing sunscreen with broad-spectrum protection and antioxidants. Active Ingredients: Extremozymes™, Octinoxate Safe, organic broad-spectrum UVA/UVB sunscreen, encapsulated for better efficacy and safety, Vitamin E, Zinc Oxide A proprietary combination of enzymes that are clinically proven to help protect fragile proteins.